Location: at Garfield Park, NW corner Garfield and Petrol St. 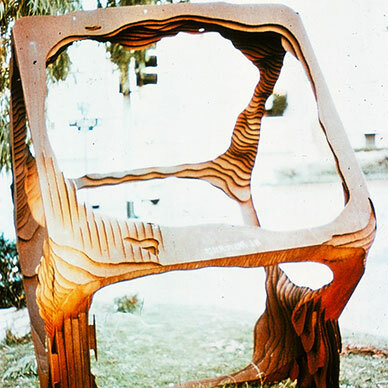 This Sculpture has a long story: Initially displayed at the Main Beach Park in Laguna Beach, where a local lady got 1,000 signatures on a petition to have the sculpture removed “because it blocked her view of the Pacific Ocean while walking her dog.” It then spent 7 years at a new location on Laguna Canyon Road. The City of Paramount’s director of development expressed an interest in Hal’s work. In 1980 HUD [United States Housing and Urban Development] published a study which labeled Paramount as a “disaster city” and ranked it the eight lowest suburb among non-rural cities with a population over 25,000 in the whole of the United States. 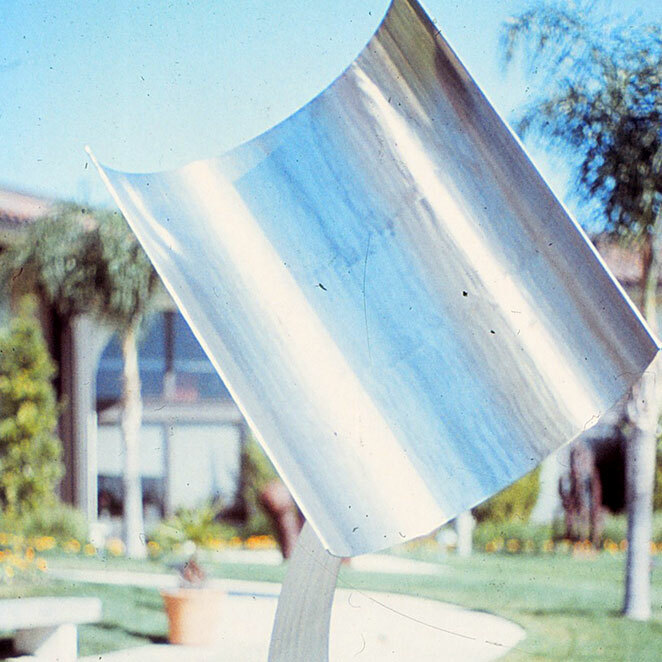 Pastorius, who had been deeply involved in the City of Brea’s Art in Public Programs, sold 7 sculptures to Paramount as the city fathers undertook an ambitious redevelopment program. They say the Outdoor Art Museum Program was an integral part of the facelift which has changed Paramount. 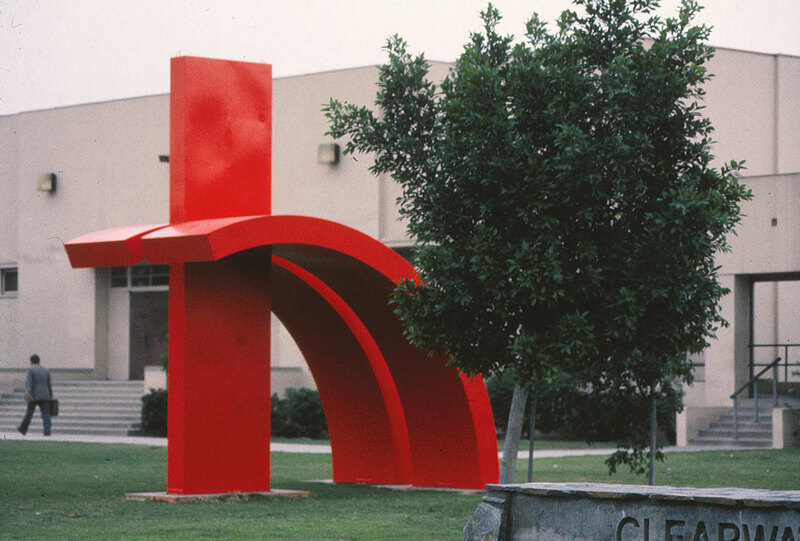 It was placed in front of Clearwater School. 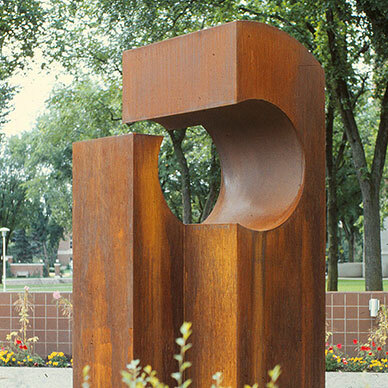 For the Unveiling the corten sculpture was painted Sterling Cardinal Red #3077. Now it sits at Garfield Park, with the paint removed to its weathered corten steel base. For a full story visit all Paramount sculptures [9x9x9, Boxes, Defiance, Delineation, Fluid, Modified Box]. Location: originally Clearwater School, currently Garfield Park, NW corner Garfield and Petrol St.